We already made estimating the cost of renovation projects quick, simple, and free with an algorithm that uses location-specific info and the genius of seasoned home renovation professionals to provide estimates that are at least 80 percent accurate. But that wasn’t good enough for us. Budgeting for a home renovation isn’t easy, and that’s why we want Kukun users to have as much information as possible. With our personalization feature, you can get down to brass tacks (or nails and screws. We hope you’re not renovating with tacks) and provide very specific info about your renovation. If you’re a homeowner, or a rental-dwelling home improvement show junkie, you’ve likely heard the term “return on investment” or ROI. What you do to your home matters, especially if you’re thinking of selling. 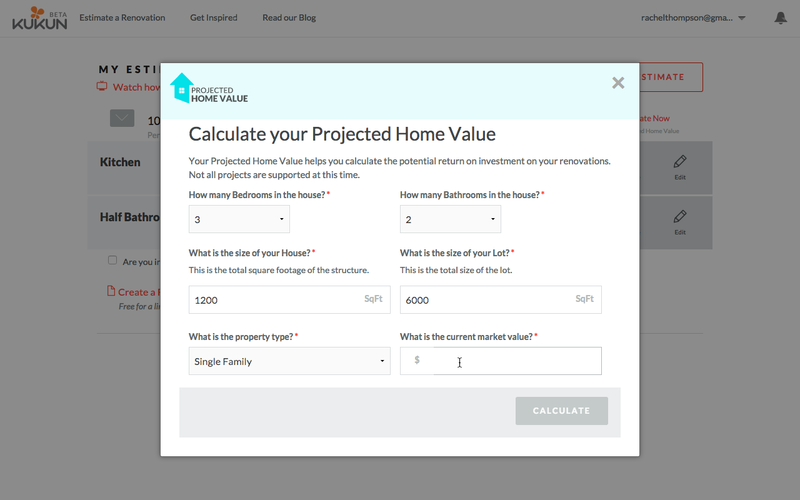 Some improvement projects have a better ROI than others, and with our new Projected Home Value feature, you can get the information you need in order to decide which renovations to take on. Simply create a project plan, input a little information about your home’s size and current value, click a button, and discover how your renovation will alter the value of your beloved house.